Tiptoeing Through: And, We're Home! After 28 days in the hospital, and well on his way to recovery, Brennen was discharged from the Janeway this past Thursday! Though he is still having some pain and discomfort, he is also having lots of happy time and big bright smiles for everyone! It is hard to believe that the surgery is over. We were so anxious about it for so long, and now (hopefully) the worst is behind us. The correction in Brennen's spine is incredible. He gained 5 inches in height, and he looks like a different child. His x-rays are shocking. As in, they literally took my breath away. The sight of all of that metal inside of his tiny little frame is really off-putting, but knowing the benefits he will gain from it makes us very hopeful. He has been sitting up in his wheelchair, and is more comfortable now than he ever has been in this chair - even so soon post-op. He still has 58 staples in his back, which will be coming out on Tuesday. The incision is clean and long and will leave him with a serious scar to show what an unbelievably strong boy he is (in case anyone needed proof). His poor little body has been through so much, it breaks my heart, but he has handled it all like a champ! Andrew and I are so happy to have our boy back where he belongs. The past several weeks have been tough on everyone, and we are happy to now be enjoying the comforts of home. We are looking forward to getting back to some sort of 'normal'. We are excited to be able to do fun things with Brennen again like we used to.. before he became too uncomfortable to tolerate any sort of activity. We are all more comfortable now. I am aware that he still has a ways to go to be fully recovered, but I cannot help but focus on the beauty of today and the amazing potential of tomorrow. 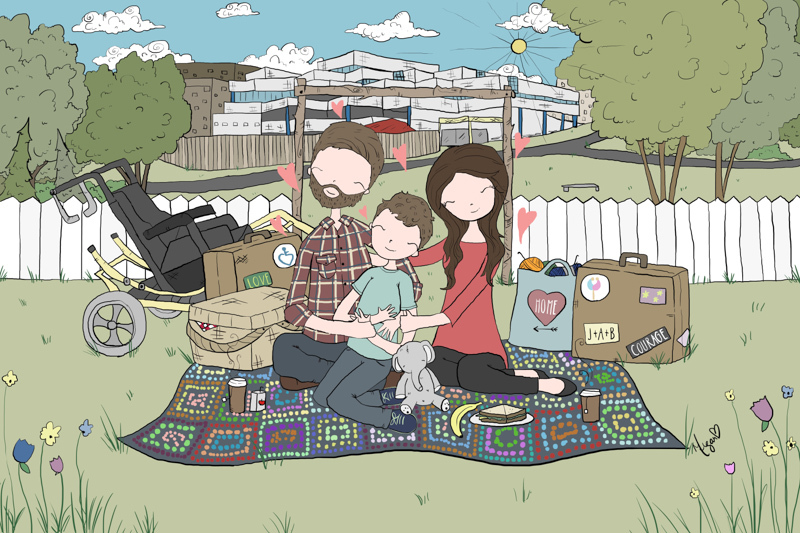 Thank you to Megan Nicole Art and Illustration for this beautiful drawing of our family - bags packed, headed home from the Janeway! It is so personal and thoughtful, and we absolutely adore it!! I can't wait for warmer temperatures to be able to get out and enjoy a picnic just like this! !